"THE AIR RAID – The long-threatened German aerial raid upon England has taken place at last. Tuesday night some sort of hostile aircraft arrived on our east coast, and paid a visit to Yarmouth and King’s Lynn. As result, two civilian inhabitants were killed in each town, a shoemaker and old maiden lady at Yarmouth, and a widow and a boy at King’s Lynn. 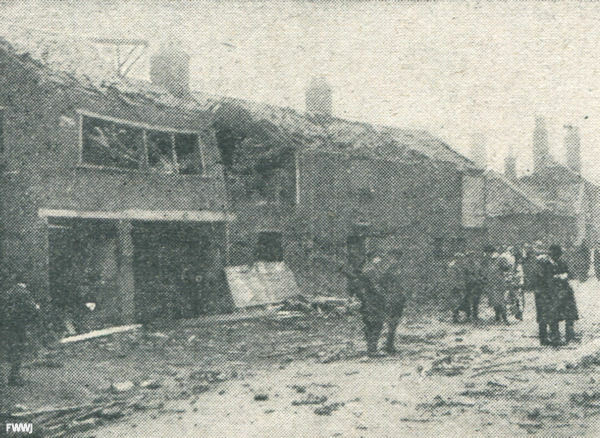 Cottages were destroyed and a church was damaged, but no employment of exaggeration can it be claimed that the incident had any military influence." Thus began the Cheshire Observer’s report (Saturday, 23 January 1915) on the air raid of 19 January 1915. 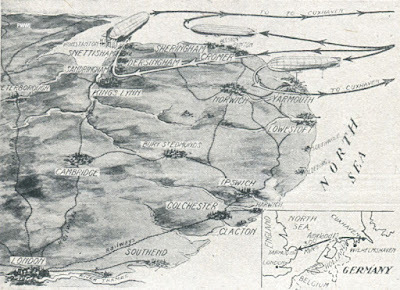 The following diagram shows relative position of the attacked towns and probable route taken by the Zeppelins across the North Sea. The Coming of the Aerial "Baby-Killers"
A thrill – not of horror nor dismay, but of disgust – went, through all Britain, on the morning of January 20th, with the news that on the previous night, between the hours of eight o'clock and midnight, Yarmouth, King's Lynn, and two or three smaller towns in the north-east of Norfolk, had been visited by German airships and subjected to a cowardly bombardment. 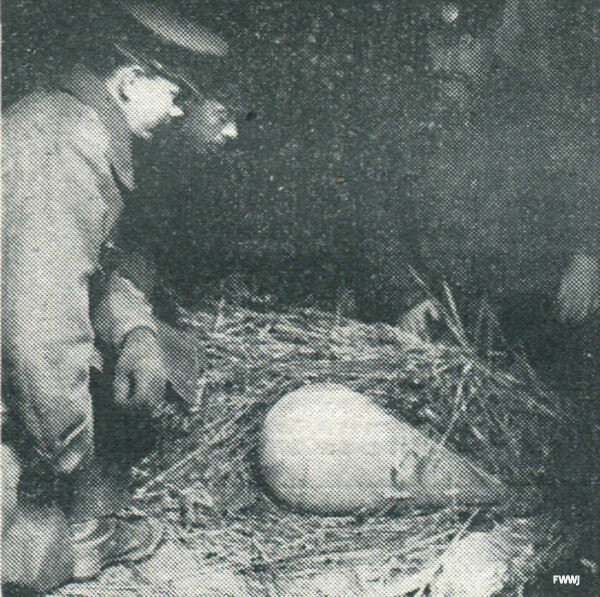 The amount of damage done was small – no more than has happened often in a gas explosion – the loss of life slight; but the loathsome blood-mud fiends who could do this foul work and rejoice stirred every Briton's heart to sterner resolve to crush that degraded nation whose war methods are more savage than those of the lowest races known to anthropology. The Zeppelins braved three hundred miles of the North Sea to do - this! Where the shoemaker Samuel Smith was killed. 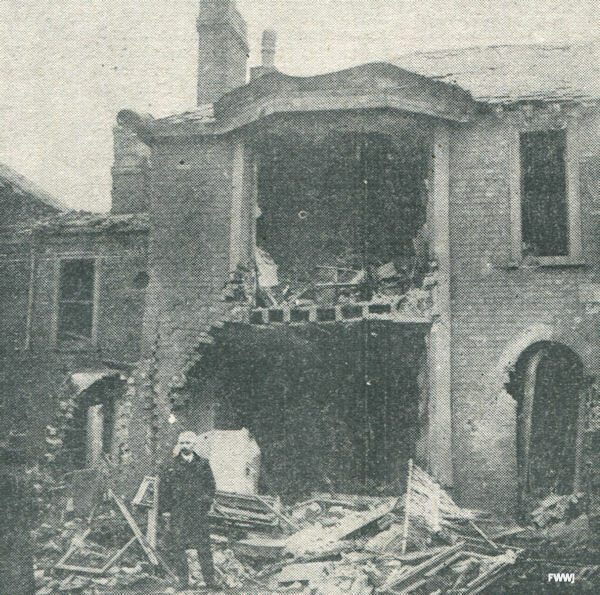 In the spring (1915), Zeppelin raids became increasingly frequent. It was popularly believed that once the airships had crossed the coast they were guided by signal lights from the land and consequently there was a period when everyone whose origin was open to the slightest doubt came to be suspected as a spy. In the Regiment's area the guiding light was believed to come from a motor car which had especially bright headlights. The result was that on several nights detachments were sent out to set up road blocks in an attempt to catch the offending car. They were entirely unsuccessful and no such vehicle was ever seen. Invariably on these occasions, however, the Zeppelin itself did come, once no less than six hours* later. Our Intelligence at that time was remarkably good and warnings of pending raids were almost always accurate. Sometimes the warning was received before the Zeppelin could possibly have taken off on its flight. The raids did little damage and no one could understand their purpose. * Normally the warning was two to three hours before. A typical one received shortly after 8 p.m. on evening read as follows: “Warn Cheshire Yeomanry Zeppelin raid expected tonight, if going London at 11 p.m., if going North earlier”.